Who doesn’t like a sparkly night sky to add that distinctive ambiance to your special event, concert, or production? 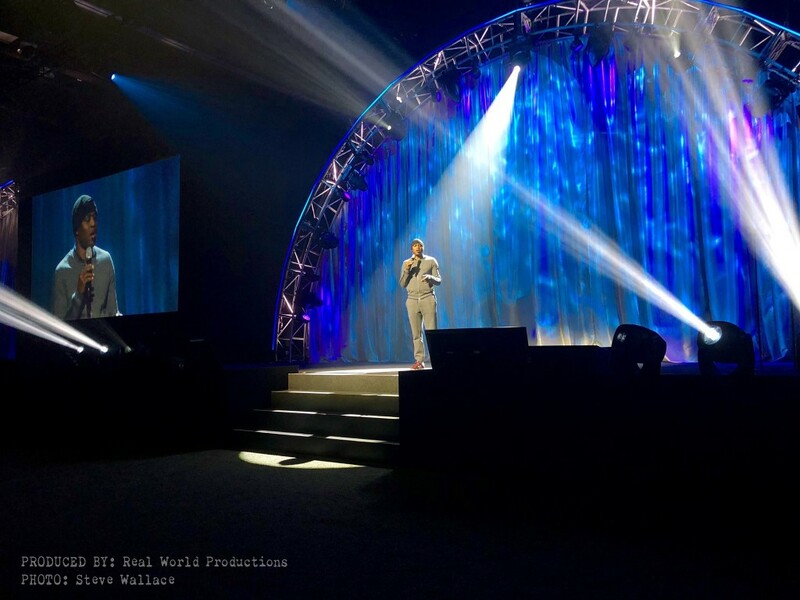 With tiny bluish-white LED lights embedded in a rich, black velvety IFR Encore Velour background, our rental Classic Stardrop LED Curtains set the scene of a lovely, crisp night sky for your audience to enjoy while comfortably sitting indoors. 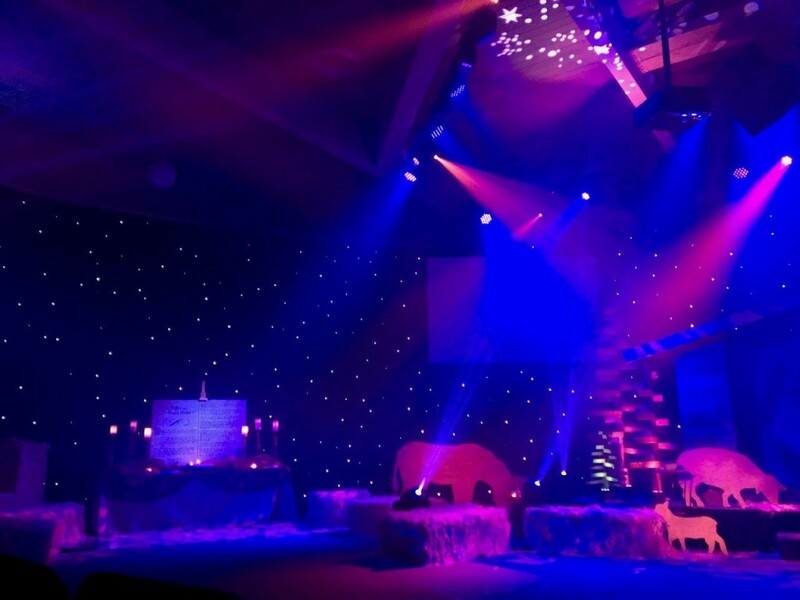 Recently we got to work with artistic producer Kevin Marks and his creative team at The Highway Community Church in Mountain View, California, on their spectacular Christmas holiday production, “Stations Of Advent.” They wanted to create a gorgeous sparkly night sky behind their manger scene and along the entire wall of the church, so by hanging together four of our 30’h x 15’w rental LED drapes, they were able to seamlessly join them together to create a continuous star field. Because these Classic Stardrop LED drapes can “rotate” at 15’ x 30’ or 7’ x 30’, they have the unique quality of being able to be hung horizontally or vertically to better suit your stage’s own unique dimensions. These are some of the most incredibly beautiful drapes, with the LEDs placed within the drape in the random formation of stunning star fields. Our Stardrop LED drapes are the ideal backdrops for productions that have numerous lighting elements for various types of scenes. These drapes offer not only a delightful “starry sky” effect, but the rich black velour material also offers a great “void” for some scenes that need to stay nice and dark. They are extremely popular for everything from a concert backdrop to a production embellishment, giving each stage extraordinary radiance. Quick to install and extremely easy to operate, this drape’s stand-alone controller can be set-up to work manually for a more plug and play operation, allowing the user to control the drape from Front of House (FOH) off-stage. The technician also has the option of controlling the light intensity, chase speed, and much more via a DMX connection to a lighting board at Back of House (BOH), making these easy-to-use draperies a lighting technician’s dream come true. Easily programmable to have the lights either remain completely static or twinkle at any speed desired, these drapes turn a simple black backdrop into a realistic starlit night sky. 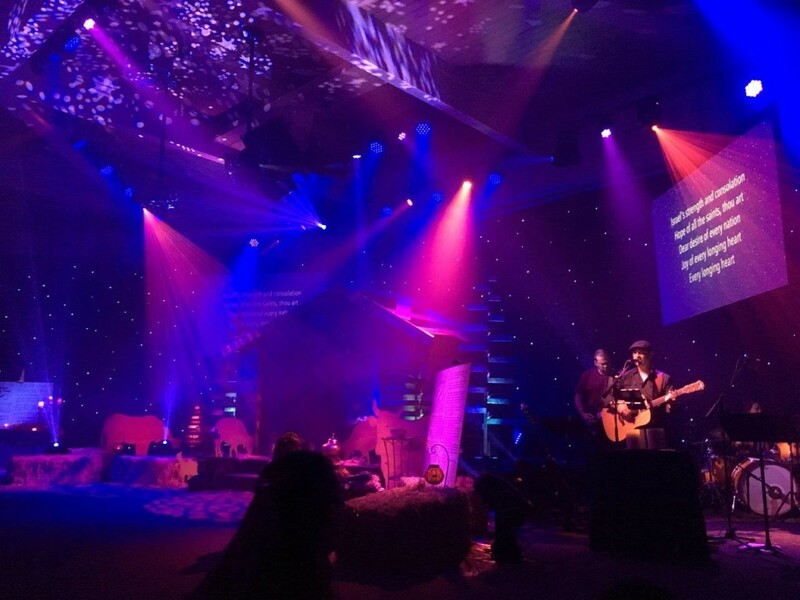 The Highway Community’s Lighting Director Brian Tucker did a remarkable job with the stage lighting of this special church production—splashing dramatic colorful lighting and striking gobo illuminations to the design elements all around the stage, and utilizing the Classic Stardrop drapes perfectly within the entire production. These durable drapes are road-ready and can be shipped anywhere in the country via Fed Ex/UPS, or via a freight forwarder for those who would prefer to use one of our drapery hampers. 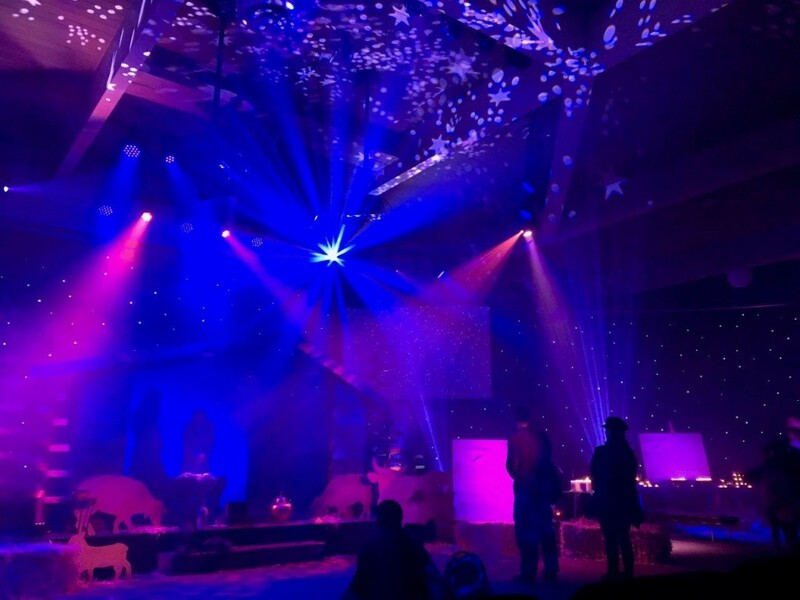 Just like with innovative folks at The Highway Community, let us also help you to create a breathtaking starry sky effect at your next special event or stage production with our rental Classic Stardrop LED drapes today! Recently I came across this awe-inspiring custom digital stage backdrop made from FR Vinyl Mesh, which was a multi-part piece printed and sewn by Sew What? Inc. for our client Triple Horse Studios. 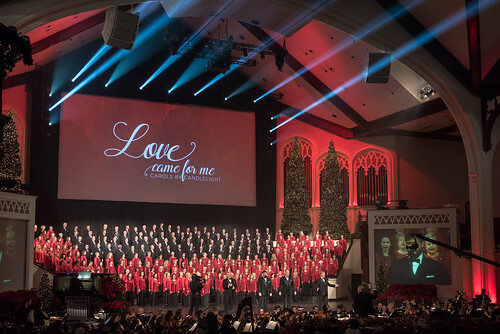 They wanted to have something truly remarkable custom-built for a large church production they were designing across the country, yet also it needed to be memorable, beautiful, AND functional. 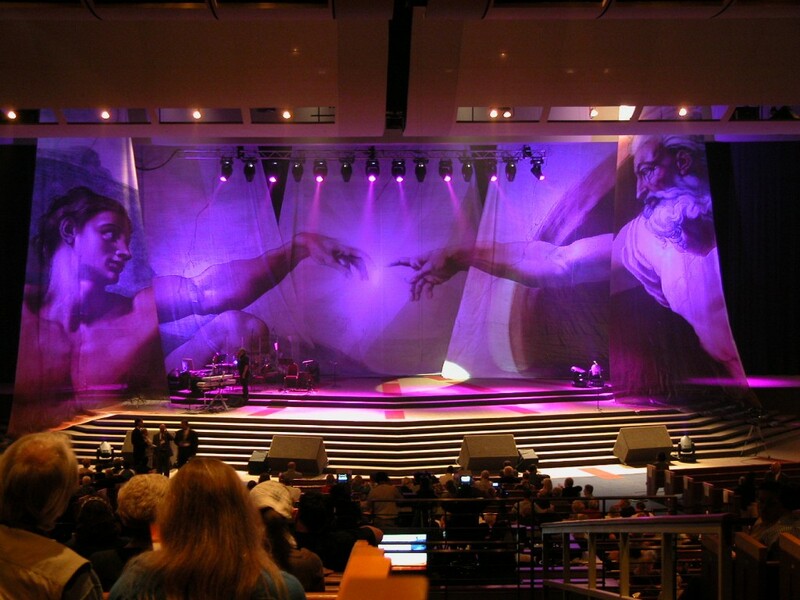 Having this directly printed digital backdrop made into 5 separate pieces (consisting of drapes 42 feet high by: 35 feet wide, 20 feet wide, and 9 feet wide) allowed maximum flexibility for performer entrances and exits as well as the potential to move to a smaller (or larger) stage in the future. The angular “mosaic” style segments lent themselves stylistically to this instantly recognizable piece of art. 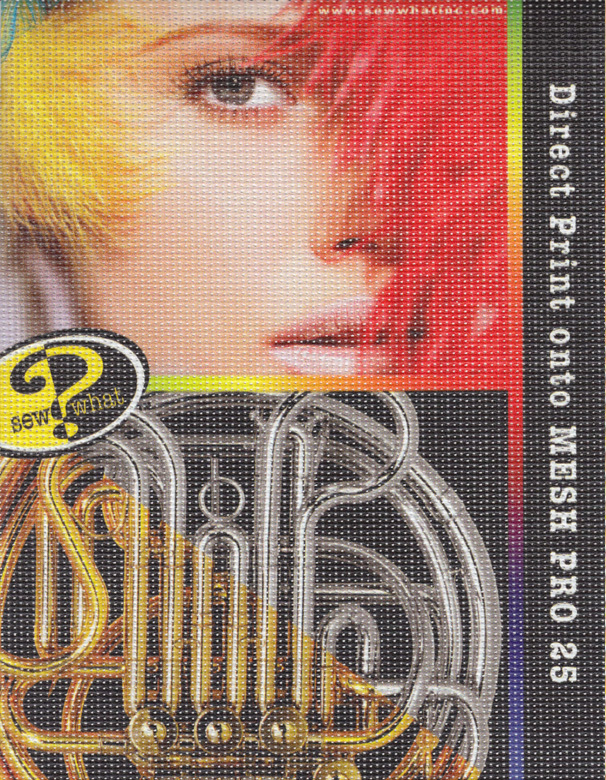 FR Vinyl Mesh is an excellent candidate for printing – often overlooked for indoor use. The color saturation and output on this heavily coated vinyl mesh surface is extremely vibrant—fantastic for both smaller OR larger sized stages. 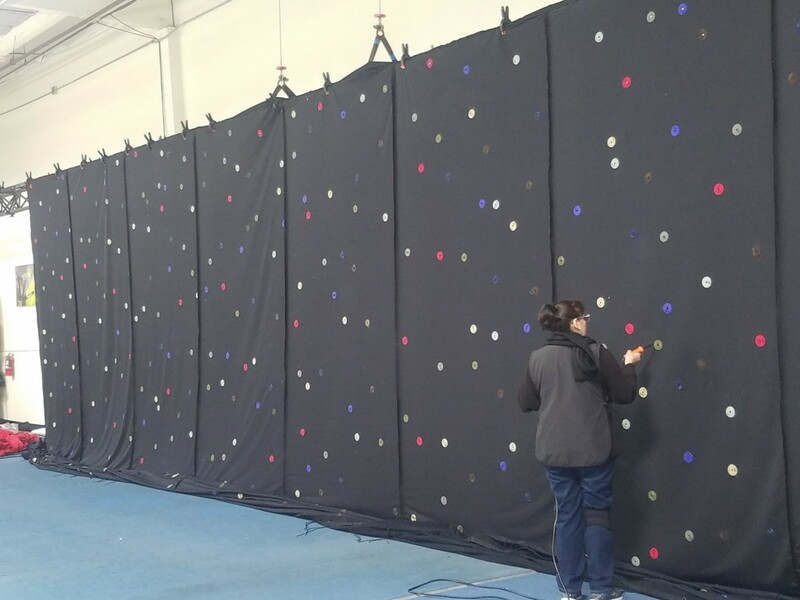 This custom theatrical backdrop made of Vinyl Mesh is great for when air circulation is of concern. This makes it an outstanding choice for indoor and outdoor events that may have sound and music elements. It is also tested and approved as Flame Retardant (FR) so you are not limited to only using it outdoors, which means it can safely be used for events and productions held in all types of venues. This specific backdrop was also “hot-wedge” welded, giving an almost “seamless” look to its vertical seams. Top-finished with webbing, grommets, and ties made it very easy to attach to the church’s in-house truss system in a manner of minutes. As you can see, the images are extremely bright and clear, which will nicely showcase your intended photo or graphic stunningly for your entire audience to enjoy—for both those that are close-to and far-away from the stage. I would highly recommend having a personally tailored digitally printed backdrop created by the talented individuals at Sew What? instead– because they can literally take any idea from your imagination and turn it into a breathtaking reality. Whatter’s Family Comes Together To Get The Job Done Right! I wanted to take a few moments to remark on how interesting and exciting it is to have my office out in the middle of the SW warehouse. When I leave the wonderfully comfortable “little cocoon” of my individual office, I never know what sights are going to greet me as I enter the main warehouse area—arguably the heart of the company! Today was no exception—as I took my first few steps, I was immediately enthralled by the hustle and bustle of my colleagues, and with seeing the eye-catching and eclectic projects that they were working on simultaneously. Everything from soon-to-be completed gorgeous drapes being sewn in shades of black and burgundy, to natural muslin drapes having the perfect finishing sewing touches being done to them, to stunning pleated red Super-Vel specialty rental drapes hanging nearby on the truss. Seeing smaller-scale custom-printed digital banners hanging in all their glory next to larger-scale, magnificently detailed digitally printed backdrops, it really showcased our company’s diverse capabilities to help create one-of-a-kind pieces for our incredibly creative event and tour designers. And with a built-to-order Chameleon LED (RGB) drape painstakingly being wired and arranged right in the middle of everything, I was so impressed with the exceptionally hard work that I knew they were putting into every single detail of that drape–ensuring that it would sparkle and twinkle flawlessly at our client’s upcoming special event. Sew What? Inc was delighted to be approached by Joe Feczko of Event Technology – Chicago to be a vendor for the 2017 Ronald McDonald House Charities event. 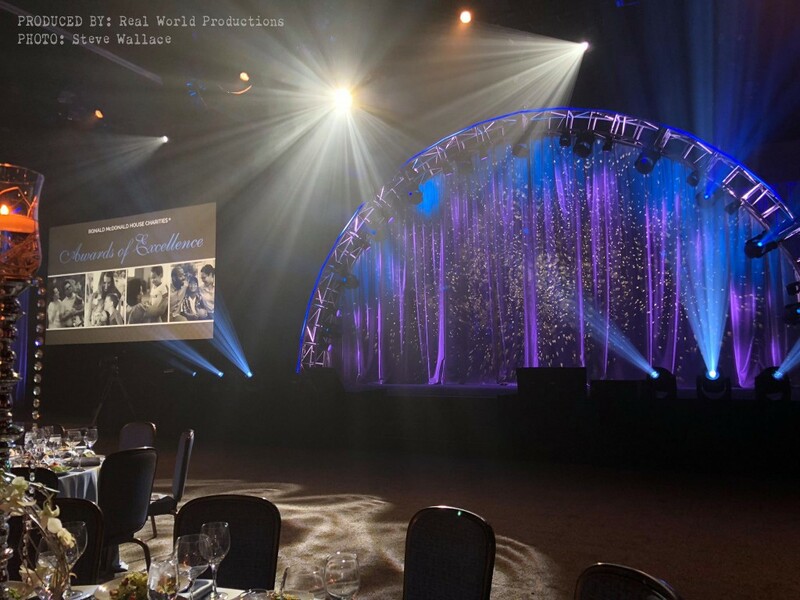 The event, produced by Real World Productions, featured a formal black-tie theme, and old school Hollywood glamour, and custom arched trusses dressed the stage. After reviewing a variety of different flame-retardant textiles, our Silver Illusion was selected as the perfect fabric. This Inherently Flame Retardant polyester cloth was the perfect choice for a variety of reasons. This soft and drapeable cloth lights beautifully, has reflective qualities giving a shimmery effect, and the dual toned thread of this cloth offers both low-lights and high-tones from the audience perspective. It is always quite a challenge to cut a curved top into heavily pleated drapery – however, the staff at Sew What? Inc stepped up to the plate and drafted a perfect pattern so that the large Illusion draperies fit perfectly into the custom curved truss. Webbing and grommets were installed into the top of the drape to allow a snug fit, and the completed scene was quite spectacular – the silver Sew What? drapery certainly offered the perfect backdrop for the awards ceremony. We would like to congratulate Dr. Chowdhury, as “American non-profit Ronald McDonald House Charities nominated Dr Mushtaque Raza Chowdhury, Vice Chairperson of BRAC, for its ‘Medical Award of Excellence 2017’ along with a grant of USD 100,000. The award was given in recognition of Dr Chowdhury’s outstanding contributions in the field of primary health care and community-based education across developing countries. The ceremony was held on 11th November, 2017, in Illinois, U.S.” For more details about this event and to read the full press release visit newshour.online. Sew What? 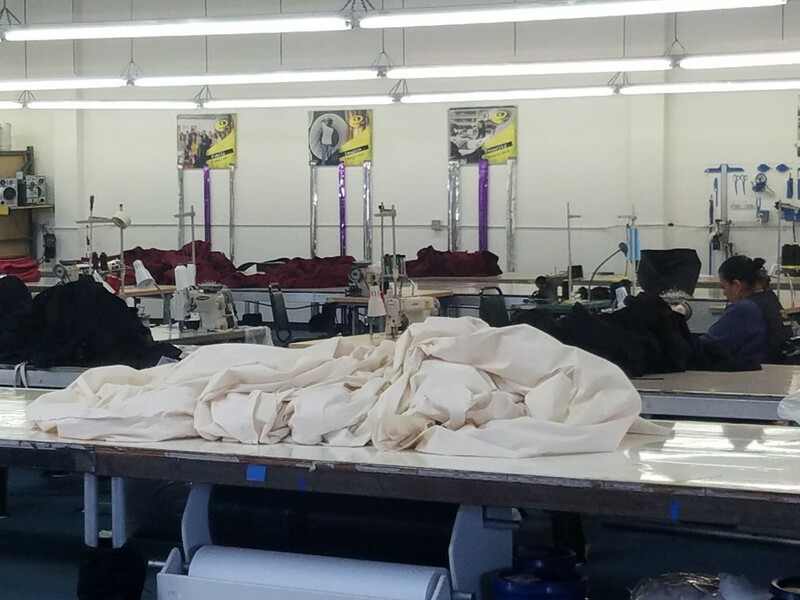 Inc., located in Rancho Dominguez, California, is a well-known stage and theatrical drapery manufacturer known for its dramatic theatrical drapes and fabrics used in major rock concerts, top fashion shows and other artistic staged venues. Their drapes have dressed the stages of Miley Cyrus, Carrie Underwood, Madonna, and Rod Stewart to name a few. The company has received numerous awards for innovation, including the Dell/NFIB Small Business Excellence Award, and was featured on the 1000th cover of Rolling Stone. For information, contact Sew What? Inc. at (310) 639-6000, or email inquiries@sewwhatinc.com. 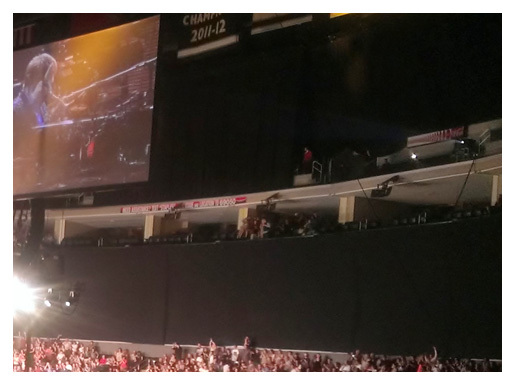 Whether you need a border to mask a lighting or speaker truss, a large drape to mask hidden surprises off stage, or multiple drapes to mask off an entire arena or help create “negative space” between other specialty drapes, Rent What? 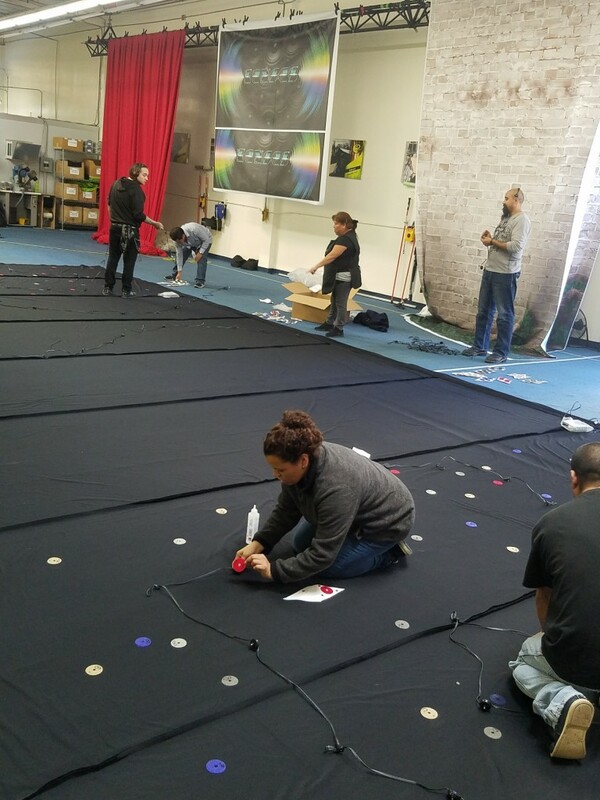 Inc.’s DFR Black Encore Velour Masking Draperies are a must for any small or large-scale production. This material is especially popular for tours and concerts because of its inherent flame resistance and extreme resilience, and also due to its rugged “tour-ready” robustness. 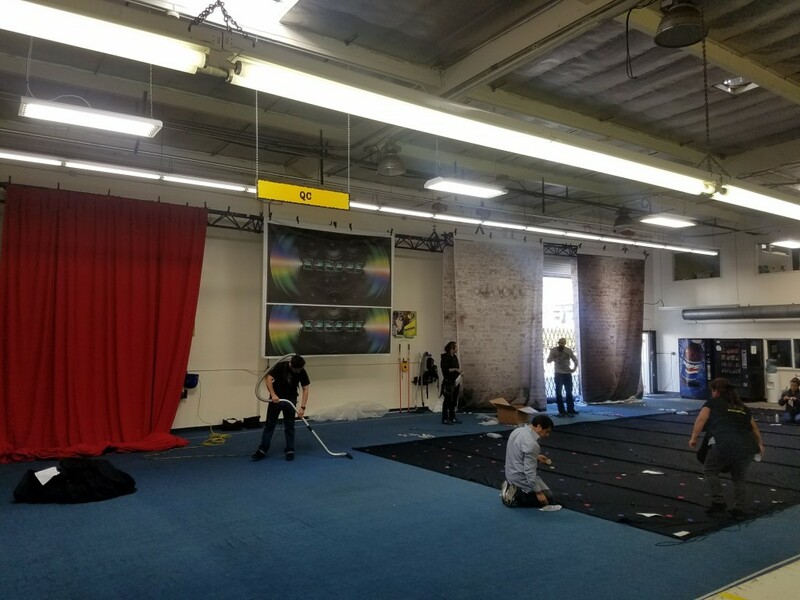 Our trustworthy masking drapes have durable webbing, grommets and ties on top, so they can be tied to truss, pipe and base hardware, or any sturdy structure you have at your venue. They are all are sewn flat, vertically seamed, and unlined to help make sure they work as an ideal way to cover anything you need. And with removable chain on their bottom hems, they lay nice and straight to help give your staging a clean, polished look. Need to frame an original stage design, or cover some unsightly cabling or hardware along your proscenium? Our black borders are topped with durable webbing, hidden sewn ties, and 1” loop Velcro, allowing you to use them either as a truss border or even as a skirt if desired. You can also use these at trade shows and conventions when you may need to mask off some smaller areas around your unique staging, too. Just recently we’ve had the pleasure of helping mask off arenas for some immensely popular national tours, as well as some incredibly dynamic church and school productions, too. 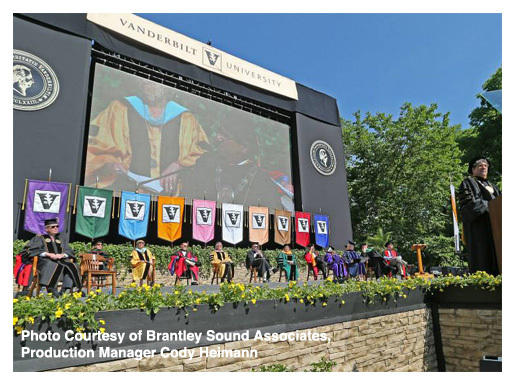 Everyone from Beyonce, Sia, Janet Jackson, and The CMAs all used our extremely versatile Black Masking Drapes and Borders for their special events and concerts. And masking drapes aren’t just for music tours anymore—they are also a great way to make a divide a large room and provide a backdrop for a special event or presentation, help to block out light or sound in a king-size venue, or even become a “frame” for projection screens like in the spectacular design recently done at First Baptist Church Jackson for their larger-than-life holiday production. With a huge selection of sizes to fit almost every type of venue and masking scenario (from 1’h to 60’h), let us help you select the perfect assortment of velvety, rich black encore velour rental masking drapes and borders for your next big or small special event.